The Medal of Honor (sometimes erroneously called the Congressional Medal of Honor) is the highest military award bestowed by the United States for valor in combat. Unlike other medals, the Medal of Honor (MOH) must be approved by the President, who awards it in the name of the Congress of the United States. The Medal, first approved by President Lincoln for members of the Naval Service during the Civil War and later extended to the other services, was made a permanent decoration by Congress in 1863. Originally, the Medal was not authorized for officers -- only for "petty officers, seamen, landsmen, and Marines," and "noncommissioned officers and privates." Since that time, more than 3,400 men and one woman have received the award for heroic actions in the nation's battles. Nineteen men received a second award. Many Medal of Honor recipients, in fact, roughly two-thirds of the recipients since the beginning of World War II, have made the ultimate sacrifice for their country in the actions which merited the award. There have been twelve Medals of Honor awarded thus far in the Global War on Terror, 7 of them awarded posthumously. To be considered for award of a Medal of Honor, a service member must have demonstrated "conspicuous gallantry and intrepidity at the risk of life, above and beyond the call of duty, in action involving actual conflict with an opposing armed force." In the early days of the award, it was not limited to active duty personnel. In fact, the only woman to receive the Medal of Honor was Dr. Mary Walker, a civilian volunteer who tended the wounded under intense fire at Bull Run, Chickamauga and other Civil War battlefields. The nation's top expert on the Medal of Honor is Pueblo, Colorado, resident Doug Sterner, himself a Vietnam veteran awarded two Bronze Stars. His website, Home of Heroes, which according to the Denver Post has more than 70,000 pages (! ), includes an exhaustive history of America's highest military honor and stories of the men--and one woman--who earned the right to wear it. On a strictly not-for-profit basis, Sterner estimates he spends 80 - 100 hours a week on his "hobby." We thank him for freely giving permission to use his material. His work is truly a labor of love, with a goal of educating Americans about the service of these American heroes. The Medal of Honor was established in 1862 to promote efficiency in the Navy. Over the years, the Medal of Honor has become a historic symbol of the bravest of the brave. As a show of respect to all who have earned it, little has been done to change its design. There are three different Medals of Honor, with three different designs: one for the Army, one for the Air Force, and one for the Navy, which is also shared by the Marines and Coast Guard. The Air Force Medal of Honor is about 50% larger than the other services' Medals. Authorized in 1956, the Air Force did not unveil its own design for the Medal of Honor until 1965. Medals of Honor are accredited according to the soldier's place of enlistment; a total of 3,459 have been awarded to date. New York, with 663, has the most recipients. Only 19 men have earned two Medals of Honor. As of this writing, there are fewer than 100 living recipients of the Medal of Honor. World War II vet and Medal of Honor recipient Bill Crawford worked unrecognized as a janitor at the Air Force Academy until 1976, when a cadet recognized his name in a historical account of the allied ground campaign in Italy. World War II Medal of Honor recipient Audie Murphy, who became famous for a Hollywood career after the war, wanted to be a Marine, but was rejected by the Marine Corps because of his small stature. At 5'5" and 110 lbs., he was considered "too small." He became the most decorated American soldier of all time, earning every award this country can bestow for valor, including the Medal of Honor. As a result of the heightened security measures imposed in airports throughout America in the wake of the terrorist attacks of September 11, 2001, Medal of Honor recipient Joe Foss was detained for about forty-five minutes by security personnel at Sky Harbor Airport in Phoenix as he attempted to board an aircraft carrying his Medal of Honor. The Marine Corps' top fighter ace of World War II, breaking the record set in the First World War by ace Eddie Rickenbacker, later Governor of South Dakota, first commissioner of the American Football League, two-time president of the National Rifle Association, and retired Brigadier General, was stopped because airport security thought the star-shaped device might be used as a weapon. In an almost unfathomable display of ignorance, they had no idea what it was! When he asked what would happen to the Medal if they took it from him, security personnel told him it would be destroyed. At that point, the silver-haired 85-year-old Foss, one of the greatest of "The Greatest Generation," demanded a supervisor, explaining, "President Franklin Delano Roosevelt presented this medal to me at the White House, and you're not going to take it from me!" Engraving on the back of the medal confirmed his story. He explained to them that he was one of only about 140 living persons (at that time) to have received the Medal of Honor. 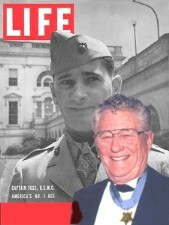 The bona fide American Hero was carrying the original medal presented to him by President Roosevelt to show to cadets at the U.S. Military Academy at West Point, where he was to be a guest speaker. After two supervisors were called, and a delay of about 45 minutes, Foss was finally permitted to board the plane with his Medal. Red-faced security supervisors realized some additional training for their screening personnel was in order. To date, eight Medals of Honor have been awarded in the Global War on Terror. Seven were awarded posthumously, to Army SFC Paul R. Smith, Marine Corporal Jason L. Dunham, Navy SEAL Lt. Michael P. Murphy, Navy SEAL MA2 Michael Monsoor, Army PFC Ross McGinnis, SFC Jared Monti, USA, and SSG Robert Miller, USA. Army SSG Salvatore Giunta is the first living recipient of the Medal of Honor from the Global War on Terror. 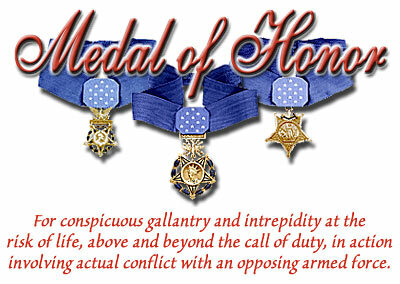 If you hear someone bragging about a Medal of Honor, he is most likely an imposter. The vast majority of Medal of Honor recipients are very humble, and generally "embarrassed" by the attention caused by the award. Frequently referred to as "Medal of Honor winners," all of them will tell you they are "recipients" of the award, not "winners" of it. They do not believe they "won" anything. Falsely claiming to have earned a Medal of Honor, or wearing or displaying a Medal to which one is not entitled, was made a crime by the Stolen Valor Act of 2005, punishable by fine and imprisonment. Yes, this legislation was necessary because, unbelievably, many are falsely claiming to have earned the Medal of Honor. The FBI reports that imposters outnumber actual living recipients, and has convicted and punished more than 100 imposters since 1996. Above & Beyond: The Aviation Medals of Honor, which tells the stories of American aviators awarded the Medal of Honor from World War I through Vietnam, with foreword by World War II Marine ace Joe Foss. With meticulous research, through official records and personal interviews, Tillman relates the stories behind the medals, and in many cases, "sets the record straight." We found it fascinating and had a hard time putting it down. The link will take you directly to the author's web site, where you may purchase an autographed copy. If you would like the autograph personalized (a great gift idea! ), just include that information in your order. Heroes: U.S. Army Medal of Honor Recipients - From the book's front flap: "From the killing fields of the Civil War, through World Wars I and II, to the jungles of Vietnam and America's fight against terrorism around the world, this comprehensive book features detailed information on 100 Army Medal of Honor winners - including many lesser-known recipients - whose courage and sacrifice in the service of their country remain the foundations of the United States Army. Their achievements are chronicled in this complete and compelling memorial of those who have earned the right to be called 'The Bravest of the Brave.'" Marcus Luttrell is the lone Navy SEAL who survived the horrendous firefight in the mountains of Afghanistan which claimed the life of Medal of Honor recipient Navy SEAL Lt. Michael P. Murphy and three of his fellow SEALs in an ambush by a much larger opposing force with a superior tactical position, after their location was relayed to the Taliban by locals in the area. Magnifying the tragedy, the helicopter bringing reinforcements was hit by a rocket-propelled grenade, killing everyone onboard. Left for dead on the side of the mountain, Luttrell's own survival is a miracle in itself. Stolen Valor : How the Vietnam Generation Was Robbed of Its Heroes and Its History , by B.G. Burkett & Glenna Whitley, documents the popular myth that portrays Vietnam War veterans as "broken men and pyschopaths." Further, Burkett and Whitley expose the widespread problem of "wannabes," people lying about their Viet Nam experiences, many of whom had never even been there. B.G. Burkett is a Vietnam War veteran who served with the 199th Light Infantry Brigade. Glenna Whitley is an investigative journalist who writes about crime and the legal system. Fake Warriors: Identifying, Exposing, and Punishing Those Who Falsify Their Military Service , an expose written by attorneys Mark and Erika Holzer of "a national scandal. Unknown to most Americans, there is a virtual epidemic of impostors in this country — countless thousands of men (and a few women) who, since the Vietnam War, have been either inventing a non-existent military service, or inflating their war records. Veterans' benefits amounting to hundreds of millions of dollars are being stolen. Military decorations are being falsely claimed, and often worn, by men never authorized to receive them — the kind earned the hard way by genuine war heroes. Unless something is done about these 'fake warriors,' their shameless, self-aggrandizing, and costly conduct will not only continue unabated; it will grow. Anyone who thinks such conduct is merely offensive and relatively harmless is misinformed." President Barack Obama was conspicuously absent at the Salute to Heroes Inaugural Ball honoring Medal of Honor recipients. Medal of Honor recipient Audie Murphy was the most highly decorated soldier in American history. Mother of Medal of Honor recipient Jason Dunham has a message for today's Marines. Navy SEAL Lt. Michael P. Murphy became the first American awarded the Medal of Honor for action in Afghanistan. President Bush presents the Medal of Honor earned by Lt. Michael Murphy to his parents.